**SAN FRANCISCO, Calif. September 9, 2015– **AliveCor, Inc., the leader in FDA-cleared ECG technology for smartphones, announced today significant milestones related to patients with atrial fibrillation (AFib) using the AliveCor® Mobile ECG. Since receiving the first FDA clearance for the AF Detector, an algorithm to detect AFib in an ECG, 30% of AliveCor patients have received an AFib detection. Additionally, more than 50% of U.S. users with an AFib detection received that detection within one week of their first AliveCor electrocardiogram (ECG) recording and close to 80% received it within one month. 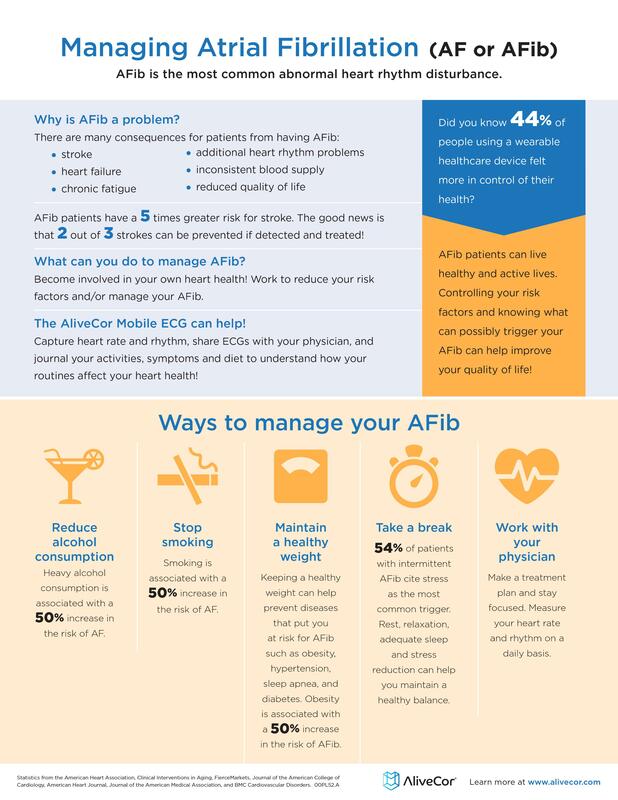 September is AFib Awareness Month in the United States, which was started in 2009 by the Heart Rhythm Society in an effort to raise awareness of the increased prevalence of the disease and the associated risk of stroke in AFib patients. AFib is the most common cardiac arrhythmia and increases the risk of stroke up to five times. AFib can be hard to detect, as symptoms, including heart palpitations, may be mild or non-existent. The ability to automatically detect AFib using mobile technology like the AliveCor Mobile ECG has now proven to be an effective and important step the detection of AFib so physicians can intervene before potentially life-threatening conditions, like strokes, occur. An important step in AFib management is to understand a patient’s lifestyle, daily activities and symptoms. The AliveECG app includes the Heart Journal, a feature that allows users to log daily activities, tag symptoms and events in real-time that can impact heart health and work to identify abnormalities. As this information is tracked alongside ECGs, both the patient and the treating physician have a more comprehensive picture of how the heart behaves under everyday conditions. Currently, 63% of U.S. users have tagged their ECGs in their Heart Journal. “AliveCor’s Heart Journal has been a helpful and easy way for me to learn about what is going on with my own heart by tracking my activities. Now, I do not have to try and remember what to tell my physician as I can easily share my notes and logs, and we can review the information together,” said Linda Jankovic, an AliveCor user since June 2015. AliveCor has seen tremendous growth throughout the past four years including expanded regulatory clearances, the launch of three algorithms, and adding almost 4 million AliveCor ECGs recorded into the AliveCor database that are being used to develop powerful insights about heart health. Additionally, the company has more than doubled the number of regular users and recordings in the last year and continues to expand globally, having entered nine new countries in 2015. The AliveCor® Mobile ECG is intended to record, store and transfer single-channel ECG rhythms. The AliveCor Mobile ECG also displays ECG rhythms and detects the presence of atrial fibrillation and normal sinus rhythm (when prescribed or used under the care of a physician). The AliveCor Mobile ECG is intended for use by healthcare professionals, patients with known or suspected heart conditions and health conscious individuals. The device has not been tested for and it is not intended for pediatric use. The AliveCor Mobile ECG is compatible with all iOS and most Android OS mobile devices. With secure storage in the cloud, users have the ability to access their data confidentially anytime, anywhere. For more information on where to buy your AliveCor Mobile ECG please visit store.alivecor.com. In honor of AFib Awareness Month, get $10 off your next purchase of an AliveCor Mobile ECG with the code AFibAware throughout the month of September. Code valid at store.alivecor.com for U.S. orders only of $49.99 or more. No prescription needed. Not valid on previous orders. Sale ends Wednesday 9/30/15 11:59PM EDT.